MOHAWK INDUSTRIES is one of the largest and oldest floor covering manufacturers in the United States. Today, the Mohawk brand name means more than just carpet. Mohawk has an entire family of flooring brands including carpeting, rugs, mats, laminate floors and hardwood flooring. So when you purchase a Mohawk floor you are purchasing more than just a floor, you are also buying from a brand name that American families have trusted for over 120 years. MOHAWK HARDWOOD FLOORS offers handcrafted beauty and exceptional quality by using the finest hardwoods and the exclusive CrystalShield™ finish. CRYSTALSHIELD™ is Mohawk's exclusive Aluminum Oxide finish for years of lasting beauty and superior protection. 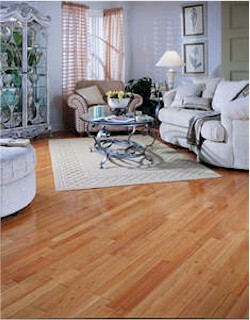 SOLID WOOD FLOORS are offered for those who want the look and construction of 3/4" solid hardwood. These floors come already prefinished which could not be duplicated with a job-site finish. ENGINEERED WOOD FLOORS are offered for those who want a real hardwood floor and do not want to worry about the problems normally associated with solid wood. All of Mohawk's engineered floors have a specially formulated, Ultra-Violet cured urethane finish and are offered in the most popular, prefinished colors. When choosing a Mohawk engineered wood floor you have several hardwood species to select from, including Northern Red Oak, Red & White Oak, Maple, Cherry and Hickory. Mohawk's Engineered wood floors carry a Lifetime Structure and Moisture Warranty, a pre-installation warranty, as well as 10, 15, or 25 year finish warranty.